Google Analytics has some really cool tools that will help you keep track of your traffic, where it’s coming from and where it’s going. Among the tools is a great visual representation of how your traffic goes through the final stages of your order checkout..
* Before the goal tracking can be active, you will need to have a valid Google Analytics account with the proper Google Analytics tracking scripts installed on each page of your website. Tutorial on how to add the Google Analytics tracking script to your Yahoo! Store. Log into your Google Analytics account and click on the “Edit” link next to the url that you want to set a goal for. 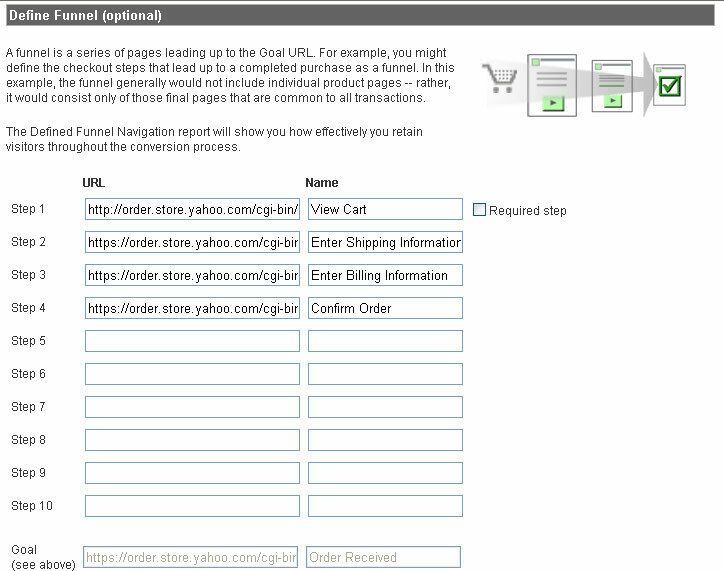 Next, scroll down to the “Conversion Goals and Funnel” section and click the “Edit” link in the “G1” row. Uncheck “Case sensitive” if it is checked. Select “Regular Expression” from the Match Type dropdown. Finally, click “Save Changes” to save the Goal Settings. Enjoy playing around with the results and when you see some abnormal cart abandonment, you can make the necessary changes to improve the conversion!